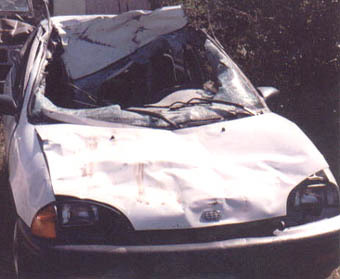 Geo Metro Crashes into Black Angus Cow Oklahoma Auto Accidents : From Car Accidents.com: I hit her hind side at 40-45 mph, never hitting the brakes. The cow came through the windshield knocking me out instantly. I hit her hind side at 40-45 mph, never hitting the brakes. The cow came through the windshield knocking me out instantly. Here is my story to the best of my ability. The events are compiled from family, doctors, OHP, and my own memory. I was on my way home from Tahlequah to Pryor after a killer jam session. I turned west from Hwy 82 onto EW55--aka Anderson Road or 'Roller Coaster Road'. I drove over a small hill and just over the peak was a full grown Black Angus cow. I hit her hind side at 40-45 mph, never hitting the brakes. The cow came through the windshield knocking me out instantly. When I blacked out, I stepped on the accellerator and veered left off the road and through a fence, coming to a stop in a field. The cow ended up in the ditch after it peeled back my roof like a sardine can. I was unconsious for about 20 minutes. When I woke, I got out of the car and walked to a nearby house only to turn back towards my car. The trooper pulled up just as I was approaching the area of the accident. I was taken to Mayes County Medical Center only to be transferred to Hillcrest in Tulsa. I had a broken orbit and maxilary sinus, a severe concussion, almost complete vision loss in my right eye, and several cuts and bruises. I could have been much worse though. I spent the next 4 days in the hospital, most of which I don't remember. Surgery was performed to repair the broken bones in my face on 11/02/2000. I now have metal plates in my head that were used to hold the bones back in place. I am much better now. I have some nerve damage, scaring, and some insymmetry. I WAS wearing my seatbelt and the airbag DID go off. All said it could have been much worse. I thank God that I'm not drooling on myself and wetting my pants. Had my buddy been with me, he probably would have been killed. Thank God something came up, and he couldn't go.